Interior designer Chiara De Rege has aimed to create a cosy atmosphere at the Brooklyn location of The Wing, a women-only co-working space that is expanding rapidly across New York. 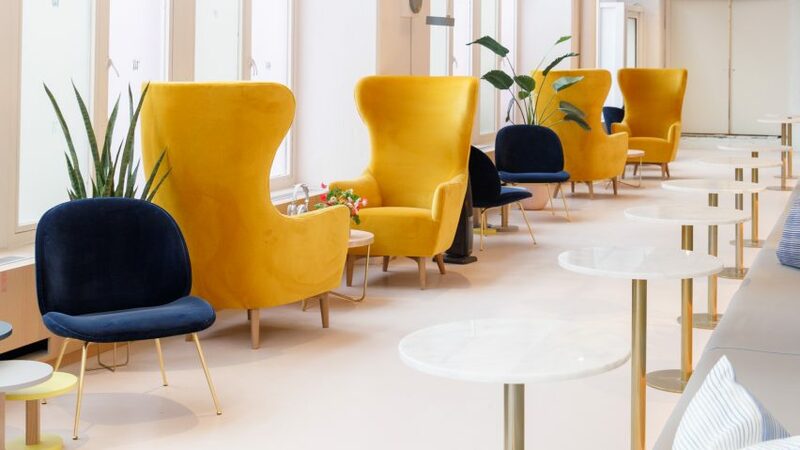 The Wing is the brainchild of Lauren Kassan and Audrey Gelman, who based the female co-working club and supportive community on the women's club movement that erupted in New York during the 19th and 20th century. After launching the first location in Manhattan's Flatiron neighbourhood in 2016, the club's popularity forced Kassan and Gelman to open a second in Soho just six months later. It is now embracing a growing membership outside of Manhattan, and its third hub in Brooklyn's Dumbo neighbourhood opened last week. "Expanding to Brooklyn was a no-brainer for The Wing," said Gelman. "A third of The Wing's current members call Brooklyn home, and it is consistently one of the most requested locations." New York-based Chiara De Rege designed the first two locations, and was enlisted again to apply the brand's homely aesthetic to an old paper factory in Dumbo – last occupied by restaurant chain Bubby's. While The Wing's other spaces occupy one-storey lofts, the Brooklyn outpost comprises two floors, a storefront and an atrium, giving De Rege a new challenge. Across the space, walls and concrete floors are tinted with the company's "Wing pink" colour, and pale oak flooring is used to "add warmth and cosiness". A mix of private and open-plan workspaces are decorated like living rooms, featuring an eclectic range of chairs and sofas in contrasting pastel and bold tones. "The goal was to help The Wing open its doors to the Brooklyn community by designing a timeless, engaging, cool, fun yet professional space," De Rege told Dezeen. Pendant lights hang above the main open-plan area, which is designed for meetings, and to host the club's programme of talks and events. Seating in the space ranges from a plush, sunken green couch to pink, tubular chairs. Tall built-in wooden shelves, filled with colour co-ordinated books, feature hidden doorways that swivel open. "What is consistent throughout is the work/lounge like furniture arrangement," said the designer. "It is conducive to event programming and networking, as well as if someone were to bring their computer to work from there every day." "All the elements work well off of one another, and I hope establish a fun but chic and inviting tone," she added. A staircase with a golden handrail leads up to first floor. Here, sofas encircle glass tables set on angular terrazzo legs and a long wooden desk decorated with headphones and flowers provides a communal work desk. Arched windows offer elevated views of the surroundings. An in-house cafe called The Perch, pink photobooths and dressing rooms with individual alcoves are among the other facilities available to members. De Rege also set up a private meeting space like a dining room, featuring a table and chairs, pink wallpaper decorated by black line drawings, and a thickly woven rug. There are also two spaces that are new to The Wing: a ballet studio with seating pads for mediation and a radio room for recording podcasts, which De Rege describes as "retro without being too retro". On the ground floor, a curved, slatted wooden desk forms the reception desk, in front of a merchandise display arranged on pegboards.